I didn’t buy the Blu-Ray editions of Princess Mononoke or Kiki’s Delivery Service because they don’t include literal translations of the original Japanese dialogue. They have the Japanese soundtrack as an option, but the only subtitles are for Disney’s English dub, which I find very irritating. Hopefully one day they’ll get it right. However, for this movie, a more faithful translation was included. Nonetheless, I started watching it (my first viewing in 12 years) with the English dub. Many anime fans find this an acceptable — even preferable — practice, arguing that 1) it allows you to concentrate more on the visuals and 2) technically, the original dialogue is a dub, too. But after 15 minutes, it just didn’t feel right. I had to switch to the Japanese audio and translation. I want to have an experience as close to the original as I can attain, and I find many of Disney’s choices questionable, even damaging. I watched a featurette about the dubbing process afterwards, and there was a moment near the end where they make Chihiro say to Haku: “I knew you were good!”. That’s such an un-Miyazaki line. He never boils the world down to “good” and “evil”. It’s one of the things I love about his work. But of course Disney has to dumb everything down. Sigh. Having made that decision, I was able to enjoy the film properly. Usually when we say something along the lines of “it feels like they were making it up as they along”, it’s meant as a negative. It implies the writer is lazy and just throwing stuff out there to see what sticks. 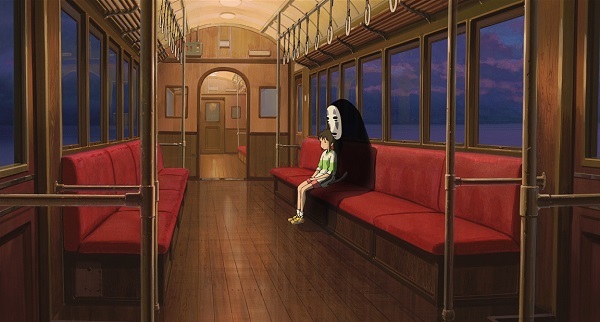 Spirited Away feels like it’s being made up as it goes along. The rules of this universe come off as arbitrary or spontaneous. You could even say certain elements are “weird for the sake of being weird”. But it still works. It still enchants. Because like the Japanese offspring of The Wizard of Oz and Alice’s Adventures in Wonderland (both of which seem like clear inspirations) the story remains grounded through its little girl protagonist. The challenge Chihiro faces is understanding how this society functions or what different beings are capable of, but it’s also a question of maintaining her basic humanity in this environment. It’s her compassion and decency that allows her to persevere, and keeps her in the heart of the viewer. This entry was posted on October 3, 2015 at 3:51 pm	and is filed under Movie Reviews. You can follow any responses to this entry through the RSS 2.0 feed. You can leave a response, or trackback from your own site. I don’t mean to be obtrusive, but I would encourage you to rewatch a.i. As someone who’s followed your site for roughly 2 years, I always wished you would revisit that gem and it seems appropriate seeing the time you have. Even if you are still lukewarm on it, as i’m frankly expecting you to be, I would still like to read a second review. Thank you for the input! But to be totally honest, I’ve seen A.I. a few times already and have little interest in seeing it again. I’m not sure what you mean about “the time I have”, but the time I have is very limited these days. I’m hardly watching any movies at all. Sorry, but I don’t foresee another review of it coming any time soon. I apologize for presuming how much free time you have. Great review. I love this film. It was the first Ghibli film I’d seen (I was pretty late to the party), and it just felt really fresh and bursting with imagination. I’ve only seen the English dubbed version, though, so will have a look at the original language version next time.